Sanitization of RO Membranes using strong chemical can damage and it can be sanitized using hot water. The main ingredient in most of the pharmaceutical products used by people is water. Given the ever-increasing concerns about the ingredients used to make pharmaceutical products, it is important to ensure that the water used is stable and consistent. The Reverse Osmosis (RO) system is at the heart of the process of water purification. It uses semi-permeable polyamide membranes that provide rejections of organic and ionic impurities that exceed 99%. The RO membranes pores are in real sense intersegmental spaces within the polymer molecules. The membranes are large enough to allow permeation of water molecules but not big enough to allow hydrated chemical ions to pass through. Below is a look at how sanitization of membranes in the purified water system is done. Several factors affect the selectivity of water molecule permeation, including the differential pressure across the membranes, temperature and pH. By using the correct operation and controls, the RO membranes can achieve excellent microbial, endotoxin and chemical quality reduction from aqueous streams. In order to control microbial growth, purified water systems should undergo regular chemical sanitization. This helps disrupt any biofilm that may protect viable bacteria from coming into contact with the sanitant. Additionally, it removes foulants that can react with the sanitizing agent and deplete it. Purified water system sanitization should be done using RO bypass. RO membranes are chemically sensitive and may damage by the strong chemicals. 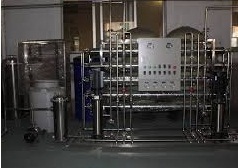 Therefore, sanitization of RO membranes is done using circulating hot water. Purified hot water (80° C) is circulated through the RO membranes. It removes the microbial contamination in the RO membranes. Water system sanitization with hot water should be done every week. RO membrane has very fine pores those may block with the small impurities dissolved in RO feed water. It can be determined by the increased back pressure of the RO membrane, This blockage should be removed by the backwashing of the RO membranes. The frequency of the backwashing depends upon the usage of the water system and quality of the feed water but it should be at least once in 24 hours. It will help to minimize the biofilm formation on the RO membrane. Microbial analysis of RO rejected water shall also inform the microbial load on the reverse osmosis membrane. The increasing microbial load in this sample shall indicate the increased microbial population on the membrane surface which requires the backwash or hot water sanitization of RO membrane and the whole system.